Let's explore another ten female names that are more on the unusual side. If you are tired of the same popular names that you hear on every 4th child you meet, here are ideas that are much less common these days. Some may have been common in the past, but for this current generation of babies being born, they're not as frequently used. The information below comes from the US Social Security Administration's 2015 list of the most commonly registered names. The first number listed is the number of births for the year, followed by the ranking number when compared to all other names. It's possible that one or more of these names could suddenly gain more usage from one year to the next. Which name do you think has the best chance of gaining a small popularity boost in 2016, if any? Marcella (170 births - #1,380 in 2015) This is the feminine form of Marcellus which is a Roman family name, a diminutive of Marcus. That was most likely derived from the Roman god Mars who is the god of war. Marcella has been used in the US since records began in 1880. It was common enough to rank in the Top 1000 until the 2000s. It officially dropped off the list in 2003 but still receives nearly 200 births a year. Could it rise again? Calista (169 births - #1,385) This comes from the male name Callistus, derived from the Greek Kallistos meaning "most beautiful". In the US, Calista appeared on the charts in 1894 but it remained extremely rare for decades. It wasn't until the year 1998 that the name got a major boost. It landed on the charts at #697 after previously ranking way down at #2830. 1999 was the biggest year with 490 births and a high rank of #519. Just as fast as it appeared, Calista left again by 2005. Will she ever return? Isadora (169 births - #1,386) This is a variant of Isidora, which incidentally is the much less popular spelling in the US. They come from the male Isidore from the Greek Isidoros meaning "gift of Isis", referring to the Egyptian goddess of the sky and nature. Isadora was used in the US since 1880 but briefly disappeared from use altogether from 1958-1968. The name hasn't ranked in the Top 1000 but it has gained births per year. Darcy (167 births - #1,394) This is the name of a well-known male literary character, or rather, it's his surname. It originally comes from the Norman French d'Arcy which refers to someone who came from Arcy in France. This name has been rather unisex over the years, but is still used more often for females. It ranked within the Top 1000 from 1949 to 1994. Could it be stylish again in the future? Pamela (166 births - #1,402) This name may have been intended to mean "all sweetness" from the Greek "pan" and "meli". It was invented in the 16th century by the poet Sir Philip Sidney in his poem "Arcadia". Pamela was first steadily used in the 1910s for females, (even popping up for males from 1941-1993) and it landed in the Top 1000 by 1925. In 1943, it was in the Top 100 for girls, ranking as high as #10 in 1953 with over 25,000 births for the year. It declined again over the next two decades, leaving the Top 100 in 1984 and it was out of the Top 1000 by 2012. Is Pamela now firmly in grandma-name territory or could it return? Tesla (166 births - #1,403) This name is most likely used in honor of the inventor Nikola Tesla who was the first to harness and control electricity. 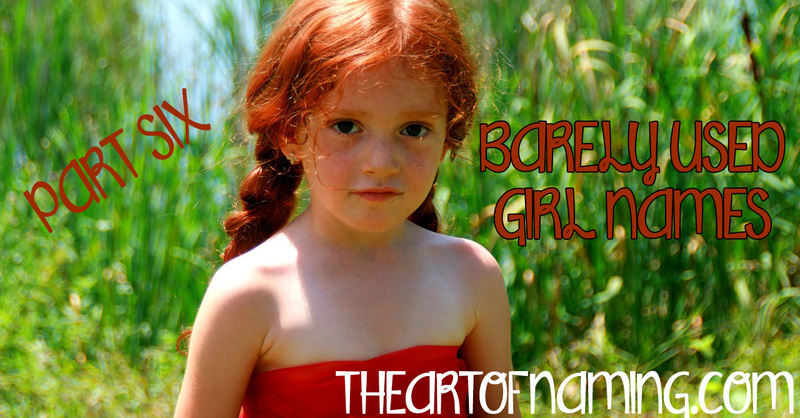 This name first popped up on the US charts for girls in 1985, and in 2009 for boys. It has never ranked within the Top 1000 for either gender. Could Tesla gain popularity, especially since it's also the name of a high-end vehicle? Carissa (163 births - #1,412) Carissa is a form of Charissa which comes from Charis and Chares, Greek names meaning "grace" or "kindness". Carissa appeared in 1949 for girls in the US, and entered the Top 1000 in 1970. It ranked the highest in 1992 at #239. It left the Top 1000 again in 2013. Will Carissa return to the top? Legacy (163 births - #1,415) This name means what it seems. From the English word "legacy," it refers to "something inherited from a predecessor". It comes from the Old French legacie, the Medieval Latin legatia. As a name in the US, this could be become an interesting unisex name. It popped up for girls first in 1994, and boys in 2008. While it has never ranked, it is doing well for girls and could continue to climb. Nadine (162 births - #1,424) Nadine is a French form of Nadia or Nadya, diminutives of Nadezhda, a Slavic name meaning "hope". This name has been around since 1887 and has ranked rather well for decades. It received 1,013 births in 1958. However, it left the Top 1000 in 2002. Will Nadine make a comeback? Salem (162 births - #1,425) Salem comes from the Biblical Hebrew shalém meaning "complete". This is a place name, most notoriously that of Salem Massachusetts where the Salem witch trials infamously took place in 1692. As a name in the US, though, it was first used in 1912 for boys. It wasn't until 1976 that it was used for girls, however it has never been common for either gender. Are there any names on this list that you'd consider for your daughter? 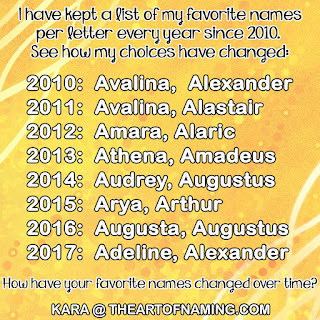 Share some first and middle name combinations!